Download "University of Texas at San Antonio Master of Arts Degree in Education Graduate Teacher Certification Program (GTCP)"
2 1. Successfully complete all coursework as approved by the State Coordinating Board for the relevant certification program with the required 3.0 GPA. 2. UTSA requires its teacher candidates to take a practice PPR exam before candidates are approved to take the state required exam. 3. Pass the appropriate TExES content area and PPR exams. 4. Complete either an internship year (two full semesters) as the teacher of record during or at the end of the program, or complete a full time, non-paid, 12 week or longer semester of clinical teaching experience at the end of the program. Both experiences are supervised by UTSA personnel. Speak to your advisor about both options. Course Schedule Once admitted, in the fall and spring semesters students take a minimum of 6 hours of course work (except during internship semesters). The first fall semester also includes a minimum of a 3 hour block, once a week, of daytime classroom field work experience. This field work experience is not part of a course or coursework. It is a state and programmatic requirement. This requirement will not be waived for any reason. Students will be placed in schools for this requirement by the COEHD Coordinator of Field Placements. Past GTCP candidates have used vacation time, personal days, or made other arrangements with employers to complete the required field work. This field experience meets the state s minimum 30-hour requirement for fieldwork in teacher certification programs. 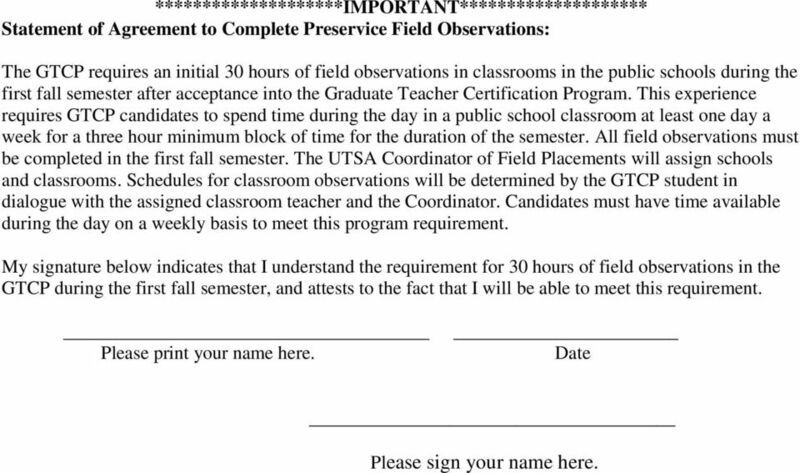 The student must show availability to complete this requirement by signing the statement of agreement to complete preservice field observations. During the spring semester, students may begin applying for internships for the upcoming fall semester. Students must be employed by mid-september of the second year in order to be eligible for the internship. Students may also choose the clinical teaching option at the end of their program instead of an internship, which requires a full time commitment all day, every day, for one semester of supervised practicum in a public school. Comprehensive exams for the degree and graduation are taken during the last semester of coursework (internship or clinical teaching). 3 Application Procedures for GTCP APPLICATION DEADLINE FOR GTCP IS February 15 TH A. 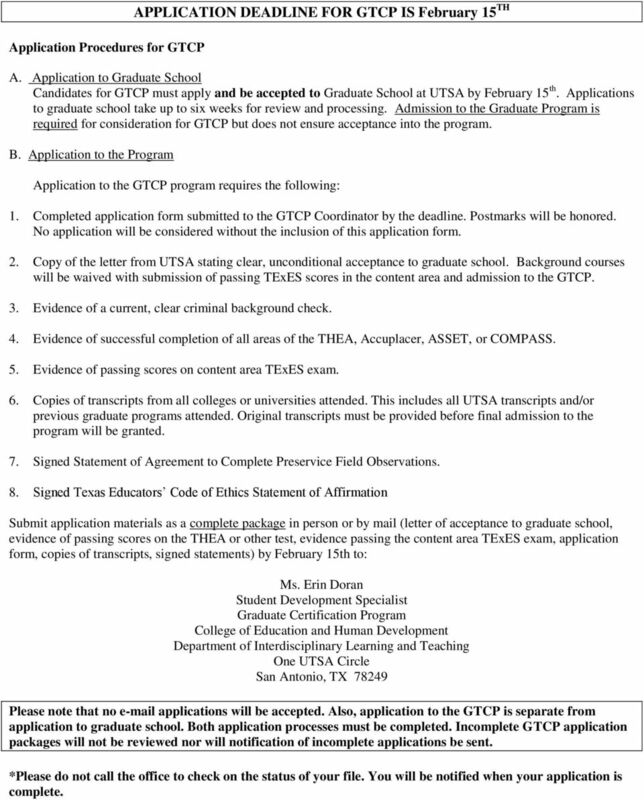 Application to Graduate School Candidates for GTCP must apply and be accepted to Graduate School at UTSA by February 15 th. Applications to graduate school take up to six weeks for review and processing. Admission to the Graduate Program is required for consideration for GTCP but does not ensure acceptance into the program. B. Application to the Program Application to the GTCP program requires the following: 1. Completed application form submitted to the GTCP Coordinator by the deadline. Postmarks will be honored. No application will be considered without the inclusion of this application form. 2. Copy of the letter from UTSA stating clear, unconditional acceptance to graduate school. Background courses will be waived with submission of passing TExES scores in the content area and admission to the GTCP. 3. Evidence of a current, clear criminal background check. 4. Evidence of successful completion of all areas of the THEA, Accuplacer, ASSET, or COMPASS. 5. Evidence of passing scores on content area TExES exam. 6. Copies of transcripts from all colleges or universities attended. This includes all UTSA transcripts and/or previous graduate programs attended. Original transcripts must be provided before final admission to the program will be granted. 7. Signed Statement of Agreement to Complete Preservice Field Observations. 8. 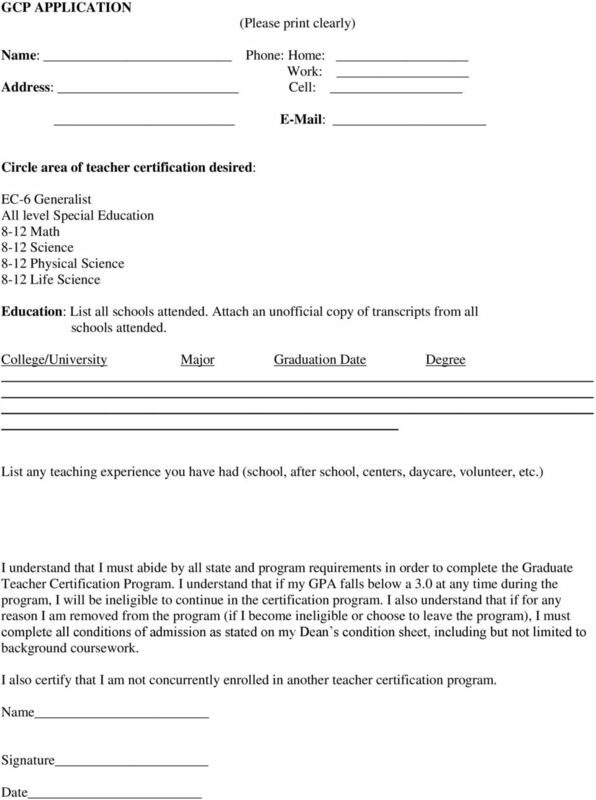 Signed Texas Educators Code of Ethics Statement of Affirmation Submit application materials as a complete package in person or by mail (letter of acceptance to graduate school, evidence of passing scores on the THEA or other test, evidence passing the content area TExES exam, application form, copies of transcripts, signed statements) by February 15th to: Ms. Erin Doran Student Development Specialist Graduate Certification Program College of Education and Human Development Department of Interdisciplinary Learning and Teaching One UTSA Circle San Antonio, TX Please note that no applications will be accepted. 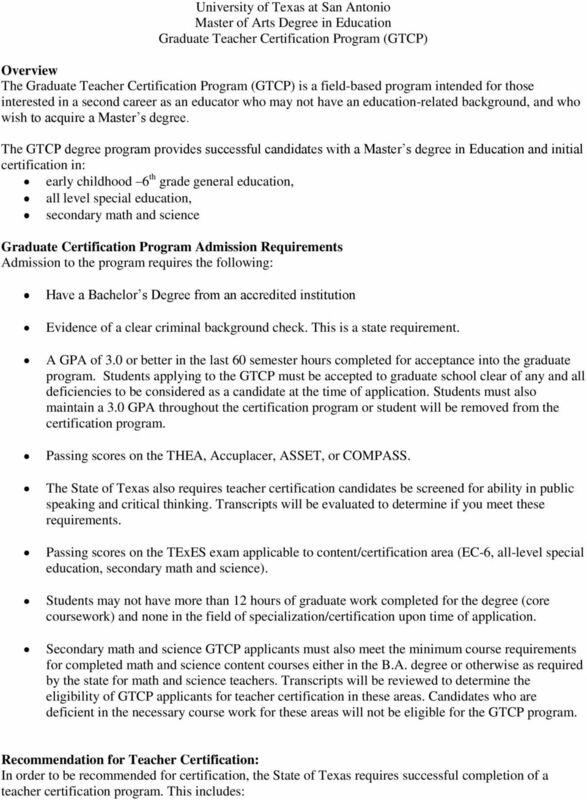 Also, application to the GTCP is separate from application to graduate school. Both application processes must be completed. Incomplete GTCP application packages will not be reviewed nor will notification of incomplete applications be sent. *Please do not call the office to check on the status of your file. You will be notified when your application is complete. 5 ********************IMPORTANT******************** Statement of Agreement to Complete Preservice Field Observations: The GTCP requires an initial 30 hours of field observations in classrooms in the public schools during the first fall semester after acceptance into the Graduate Teacher Certification Program. This experience requires GTCP candidates to spend time during the day in a public school classroom at least one day a week for a three hour minimum block of time for the duration of the semester. All field observations must be completed in the first fall semester. 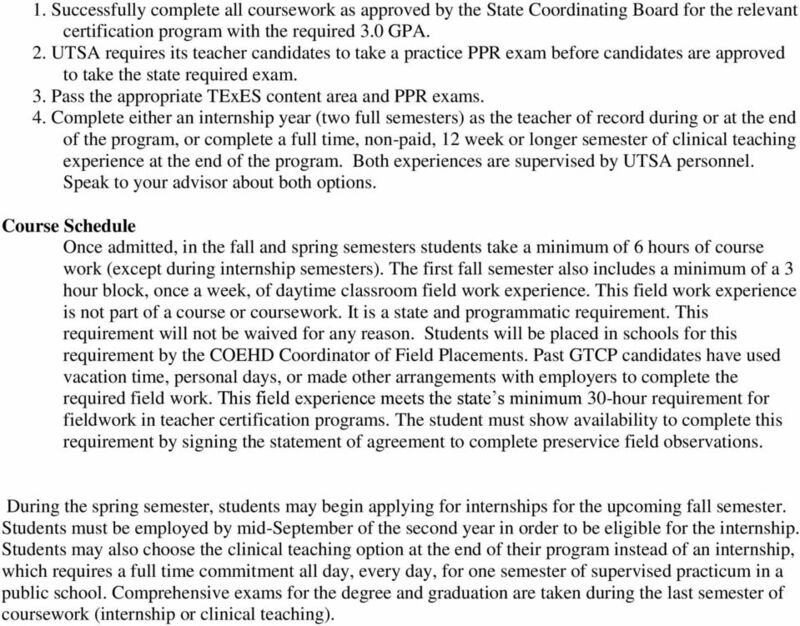 The UTSA Coordinator of Field Placements will assign schools and classrooms. Schedules for classroom observations will be determined by the GTCP student in dialogue with the assigned classroom teacher and the Coordinator. Candidates must have time available during the day on a weekly basis to meet this program requirement. My signature below indicates that I understand the requirement for 30 hours of field observations in the GTCP during the first fall semester, and attests to the fact that I will be able to meet this requirement. Please print your name here. Date Please sign your name here. Child Development Associate Training Program Checklist. Thank you for your interest in our Child Development Associate Training Program! Doctor of Arts Idaho State University revised 09/05/2014 ENTERING THE D.A. PROGRAM: DEPARTMENT OF POLITICAL SCIENCE IDAHO STATE UNIVERSITY DOCTOR OF ARTS 1. Make application to the Graduate School, non-refundable.